As fiber artists and crafters, how many times have we heard the admonition "before you start your project . . . weave a sample or knit a swatch or spin a control or test dye a new color"? I know that the vast majority of you are saying, "I never sample". Am I right? Oh, there are a few of you who wholly believe in sampling; actually savor the process. But I've heard even the gurus of the fiber arts world admit they don't always sample or swatch. Why are we so adverse to the idea of sampling or swatching? My own thoughts coincide with many sample avoiders; it just seems like a waste of time and materials. Being the frugal German I am, I don't want to use my precious supplies for a sample! And I don't want to take time out to sample because when I'm ready to begin a project, well, I'm ready to start! First, let's review some traditional reasons to sample. In weaving, it can be to trial how thread colors or texture variations might interact in your weave structure. In knitting, a gauge swatch can help to adjust your needle size or yarn to fit a particular project. And, as we've all heard, you really should finish your sample or swatch, ie., washing, pressing, and blocking to see if there will be color bleeding, shrinkage, or felting? After all, isn't it better to "waste" a little than a whole lot of time and material to avoid an unforeseen disaster? Ok, but let's move beyond those standard motives and explore what I think are a few more interesting objectives. As in my case, I'm currently weaving samplers as a means to study weft-faced pattern weaves. I want to really grasp and understand the technique and all its design possibilities. I want to perfect my technical skills so I can produce beautiful woven pieces. Ultimately, I want to share what I've learned through this blog, a book, and/or workshops. Samplers can be used over and over as a design tool for planning projects. Sampler I that I posted about a few weeks ago, displays some great pattern ideas to choose as a decorative border on towels or runners. SAL are great for breed and color studies. Above are sample cards and small handspun skeins from my breed studies of Jacob and Coopworth wool. WAL are perfect to explore various structures (overshot, laces, double weave) or a particular textile (rug making, towel exchange). KAL allow everybody to knit the same project but vary the color or fiber choice. These 'a-longs can be found online through retailers, in Facebook groups, on Ravelry or on individual websites. They also make a fun Guild project. The benefit of a group doing a project is that many more variations can be explored and the results and lessons learned can be shared. The means of sharing can be informal or an in-depth year long study with a group show or monograph published at completion. Historically, samples were woven to share with guild members; often marked with notes about structure, technique, and color choices. These have been passed down in notebooks and samplers and provide us with not only the insights of those weavers but also a perspective of trends in different time periods. Just think about how valuable it is to see a swatch rather than just the draft or pattern alone. Even well written instructions and fabulous photos can not take the place of seeing how the threads interconnect and the fabric feels and drapes. Dr. William G. Bateman was a prolific weaver of samples. His samples are the focus of numerous published monographs and a Complex Weavers' Study Group. This is just one example of an historical sample collection. But, contemporary examples can also be used to teach, as in the example above of my color ring of naturally dyed wool yarn samples that I use in natural dye workshops. I think about vintage quilts made from scraps of fabric leftover from clothes and other home textiles. Or embroidered samplers that use up bits and bobs of threads remaining after the completion of larger projects. Or as in the case above, I wanted to try an art yarn technique called extreme fiber in which I literally reached into my bag of leftover fibers and tiny yarn pieces and spun whatever I pulled out. Though I may never use it, it was a learning experience in spinning a variety of textures without "wasting" my "good" fiber. You may be a beginner and not want to invest a lot of money in equipment and supplies, before seeing if you like a particular fiber art. Or you may just want to complete some quick little projects. For weavers, Swatch Maker looms and Wee Weaver looms are economical and perfect for this purpose. Here's a link to a video on warping the Swatch Maker looms. 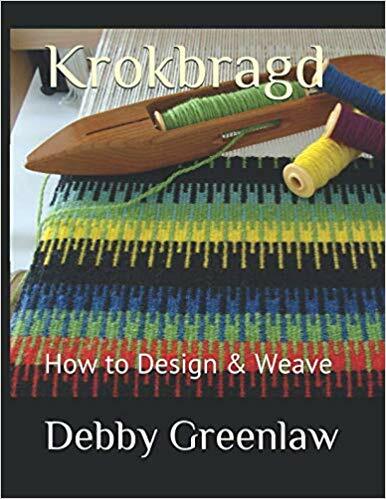 In fact, Liz Gibson has a book dedicated to weaving on these Purl & Loop looms. Speaking of books, here is another you might enjoy. In Samplers You Can Use, Penelope Drooker gives some historical background on samplers and discusses the process of designing a functional sampler. She includes actual projects with complete directions for a dozen different woven samplers. Here are just a few items that I have made with my samples and swatches. This is a sample I wove prior to starting the large Greenlaw tartan project. I used the small swatch to cover one side of a pillow. This is a sampler of various Swedish Art Weave techniques that I made into a small tote. Coasters each sampling a different krokbragd design. This is a pattern weave sampler of pick-up and finger-controlled techniques that I display as a wall hanging. Here is a really cool idea that is not mine but that I saw posted on Facebook by Nadine Basile. Each swatch is a different sheep breed that Nadine spun, knitted, and then created a hanging. Bookmarks (idea from North of Boston Handweavers - handweave with handspun yarn from various sheep breeds). This group sells samples of handwoven fabric. Each sample contains a swatch of fabric, its draft, and information on the materials and wet-finishing techniques used to make the sample. All proceeds benefit CNCH (Conference of Northern California Handweavers). A delightful read on knitting swatches and a bonus of some swatch projects! A fun project where everybody knits an 8" x 8" swatch, sends it to Melissa at KnittingtheStash, she plans to seam them into a blanket and offer it as a giveaway to one of the participants. So, with all that said on samples and swatches, I have completed two more samplers in my weft-faced pattern weaves study. You have already seen some close-ups; one in the post header and the other in the 'Learn Your Craft' section above. I've already started Sampler IV which is another Twill, this time 2/2 on Opposites. When I complete that one, I'll do another post with details on all three twill samplers.